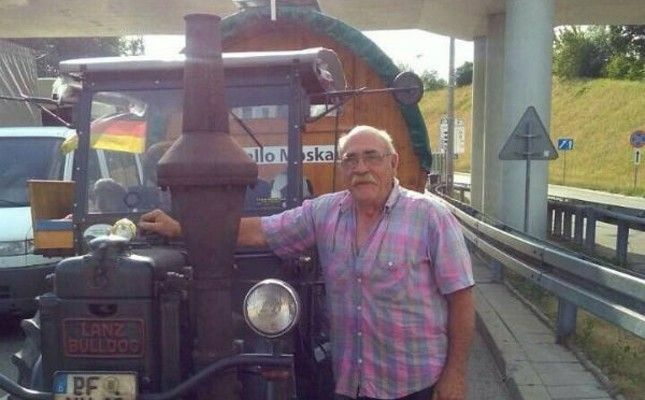 An elderly German football fan embarked on a journey to Russia, which is hosting the 2018 World Cup, on a tractor with a trailer. The 70-year-old man surprised Belarusian guards when he arrived at the border on his vehicle with a huge beer-barrel-turned-house-on-wheels trailing behind. The tractor named Bulldog was decorated with the World Cup symbols and a sign that says "Hallo, Moskau!" ("Hello, Moscow" in German). Going at a pace of 30 kph (18.6 mph), the man, accompanied by his dog, said he expects to be in Moscow in 10 days. The World Cup will take place from June 14 to July 15 across 11 Russian cities. Current title holder Germany will face Mexico, Sweden and South Korea at the group stage.